The Innovative Pedagogy Framework (IPF) is explained in Section 4 of the Meta-analysis report. This framework provides a tool for teachers who wish to reflect on their pedagogy. This is relevant when considering ICT use in school as the NP3 Project findings suggested that in addition to the curriculum and accountability systems, teachers’ own ideas about teaching and learning had an impact on how ICT was used in schools, individual classes, and different subject areas. The following comparison of two schools, one in England and the other in Scotland may help clarify how the IPF may be used to help clarify the pedagogical stance within a school. Section 11 of the Meta-analysis report provides further examples of how the IPF can be used, with two examples that compare the pedagogical models of teachers within the same school. Fairfield community primary school was in a prosperous village in Central England. Ofsted judged the school to be ‘Good’ in both 2011 and 2016. The head explained that the school’s popularity was related to their high standards. The focus was on the whole child and not just academic success. The head noted the importance of the local community and spoke about the children going on visits at least once per term (e.g. to the railway station and local Church) and also about members of the community visiting the school (e.g. the local vicar). These visits were to engage and interest the children. This focus on extrinsic motivation aligned with the Traditional model in The Innovative Pedagogy Framework. The head teacher described Fairfield’s pedagogical approach as ‘quite formal’. The pupils tended to do the maths and the English lessons in the morning ‘for concentration purposes’ and then focus on topic work in the afternoons. A ‘good lesson’ was judged to be one that was ‘pacey’ and ‘not dull’. Furthermore, the lessons tended to begin with the learning objective being written on the board, ‘input’ from the teachers, some opportunities for children to discuss and also to work individually. This approach ties in with the Traditional model in The Innovative Pedagogy Framework. Despite the fact that all classes were equipped with IWBs, the prevailing pedagogical stance meant that this, and other forms of ICT tended to be used to support the existing curriculum and approaches to learning and teaching. In one observed lesson the IWB was used to model writing an acrostic poem before children wrote their own individual ones. 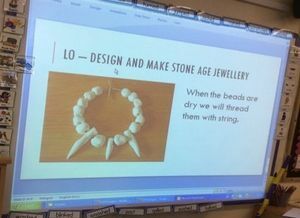 In another class, the IWB was used to display an image of a Stone Age necklace which the children then made using clay. Byrne Primary is situated in one of the most deprived areas of the rural highlands of Scotland. The head stated that ICT was at the heart of the school vision to extend the children’s horizons and to develop “skills, independence of thought and resilience to succeed and contribute to society”. The head teacher positioned himself as a learner and regularly dropped into lessons to talk with the children (often about their use of ICT). An ethos of trust pervaded the school and children were allowed to move freely around the school building (except the nursery) during breaks and were observed freely entering the staffroom and chatting with teachers. 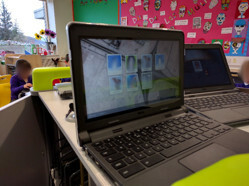 Despite not yet having sufficient Chromebooks for every child to have their own, children were allowed to make use of resources (including Chromebooks) without always asking permission and were often allowed to choose whether to work collaboratively or not. Whilst there was insufficient evidence to confidently map the practices in Byrne Primary to The Innovative Pedagogy Framework (IPF), it seemed clear that it sat somewhere between the Constructivist and Innovative models in terms of ethos and the practices in the three lessons that were observed. Pupil agency (at least in the sense of being expected to make decisions about how to carry out tasks set by the teacher) and collaboration appeared to be pervasive elements of practice in Byrne Primary. There appeared to be a level of mutuality, at least in relation to ICT competence (and local history for one of the teachers, Ms Campbell). More generally mutuality, and being co-participants in a learning community seemed to be reflected in the trust and freedom of movement around the school that pupils enjoyed. This seemed to fit the Innovative model within the IPF. This page was last modified on 29 June 2017, at 11:53.